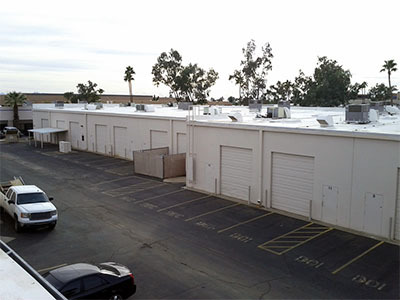 Commercial foam roof maintenance in Phoenix is a big responsibility. There a variety of benefits when it comes to foam roofing. Those benefits are essential for commercial building. A commercial building accommodates business offices, schools, stores and more. Most people spend half of their time inside those buildings, building up the electricity bill. Plus, the building itself, it expose to the Arizona weather. With commercial foam roofing, there is will an improvement within the energy and the protection against the weather will be outstanding. 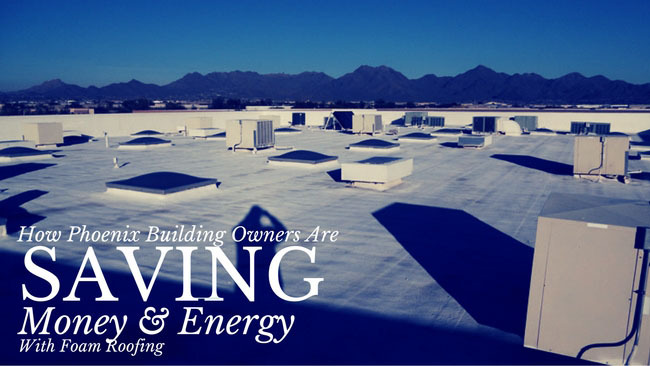 The number one benefit of commercial foam roofing in Phoenix is the increase energy efficiency that it provides. The foam is a natural insulator, which will lower the cost of utility bills. The foam minimizes the heat loss during the winter, allowing the heat to remain in the building, rather than escaping through the roof. Same concept during the summer. The building will be at cool temperature, allowing the air condition system to work as much as 35% less than the other types of industrial roofing. The way the foam works is it sealed with an elastomeric coating that makes it reflect the UV rays. It basically bounces the sun rays off the building. A nice feature, considering that Arizona is the desert, and the sun is always blazing at buildings. Foaming roofing is applied as a combination liquid made of separate components. When the liquid is sprayed on the roof, it will expand 35 times its original volume. After a few minutes, it will form a closed-cell environment. What does that mean? If the commcerial building has any crack or crevasess, the foam will fill those in. The foam is originally a liquid form. When a roofer sprays the foam, the liquid will flow into the cracks and cravasses. From there, it will expand and harden. Which means that it will eliminate leaks around flashing and other areas that are often prone to leakage. Commercial roof foaming is a seamless, waterproof application. Once the liquid foam hardens, it will enhance the durability of the roof. Commercial foam roofing will last for about twenty years with the proper maintenance. Proper commercial foam roof maintenance may include a recoat of the foam after the first five years, along with other necessary commercial roof maintenance. Other then that, there won’t be a required recoat after another twenty years. On that note, once the first spray foam dries, it will be extremely hard and provide a remarkable protection against wear and tear under normal industrial roof use. 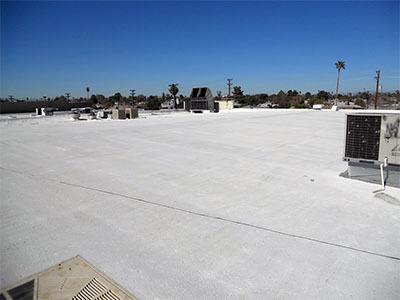 The last benefit of commercial foam roofing is that the foam roofing installation in Phoenix is fast. A complete application is one coat of sprayed foam. Depending on the size of the building, that means that the roofers will be around a a day to maybe a week. Once the foam is sprayed, it will dry almost immediately. It might as well be the fasted roofing job there is. There are a handful of buildings in Phoenix, Arizona that can benefit from commercial foam roofing. Schools, healthcare facilities and office building roofs are the top commercial buildings that can benefit. School roofing needs to be insulated well, or we’ll have students and teachers trying to make it through hours of class in various degrees of discomfort. Schools are always on a tight budget. If you're in charge of the roof maintenance, consider this. Spend the necessary expenses to have a foam roof, which can maintain the school’s roof waterproof and insulated for up to twenty years. It’s an investment. For twenty years, hopefully, the roof will not need any serious maintance. Healthcare roofing has to meet a number of parameter for it to make sense. The nurses, doctors and patients need to be comfortable. Since a healthcare foam roofing doesn’t demand any HVAC resources, as the building owner, you don’t have to worry about a power shortage. Plus, have a foam roof will be one less thing to worry about. Office buildings don’t necessarily means that the clients/customers will pay any attention to the roof. However, the building’s temperature will be noticeable. Plus, the last thing you want as a commercial property owner is to have any of your office building roofs spring aleak. That will cost money on foam roofing repairs in Phoenix, and lease s. With a foam roof, you won’t have to worry about a leak. If you are a commercial property owner in the state of Arizona, and need any roof maintenance, consider foam roofing in Phoneix. Commercial foam roofing maintenance will be the best investment that you can make. The people utilizing the building will be happy and there will be less compliments about the building temperature and no roof leaks! So what are you waiting for? Contact us, 1st Class Foam, to speak with a professional Phoenix foam roofing contractor that is dedicated to quality workmanship.